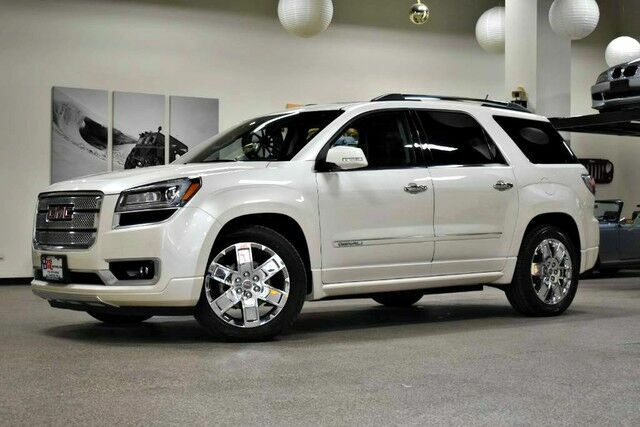 2014 GMC Acadia Denali AWD with 51,000 miles is a fully loaded model. It has a clean Carfax history and is shows how nice this vehicle has been taken care of. Fully serviced and drives great, very nice color combo. Please look at all the pictures to see how nice this vehicle is. This GMC includes: LPO, ALL-WEATHER FLOOR MATS, FIRST AND SECOND ROW Floor Mats ENGINE, 3.6L SIDI V6 V6 Cylinder Engine Gasoline Fuel SEATING, 8-PASSENGER 3rd Row Seat Rear Bench Seat AUDIO SYSTEM FEATURE, BOSE ADVANCED 10-SPEAKER SYSTEM Premium Sound System LPO, ALL-WEATHER FLOOR MATS, THIRD ROW Floor Mats WHITE DIAMOND TRICOAT TRANSMISSION, 6-SPEED AUTOMATIC (STD) A/T 6-Speed A/T EBONY, SEAT TRIM, PERFORATED LEATHER SEATING Leather Seats AUDIO SYSTEM, COLOR TOUCH NAVIGATION RADIO WITH INTELLILINK AM/FM/SiriusXM/HD HD Radio Navigation System CD Player AM/FM Stereo Satellite Radio Bluetooth Connection Auxiliary Audio Input MP3 Player WHEELS, 20" Chrome Wheels *Note - For third party subscriptions or services, please contact the dealer for more information. * When you purchase a vehicle with the CARFAX Buyback Guarantee, you're getting what you paid for. This SUV is a superb example of what a tough, work focused vehicle should be. Exceptional towing, acceleration and torque will help you get the job done.